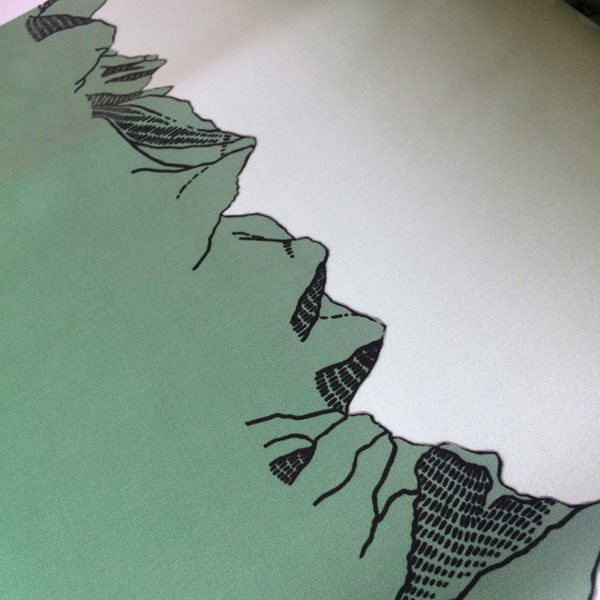 Big, big thanks for all your wonderful comments and enthusiasm over the new Print Club project and especially, Laurie King's amazing first "Head for the Hills" print! We've both been blown away by the demand for the kits, so don't wait around if you're tempted - they really are very limited edition... Today I wanted to give some tips for using the kit, especially for all of you who bought the Steeplechase Leggings pattern alongside it! Today I wanted to give some tips for using the kit, especially for all of you who bought the Steeplechase Leggings pattern alongside it! The kit comes with a metre of specially printed tech fabric, plus elastic for the waistband, a sew-in label, a sticker, and some info sheets. The first thing to do is wash your fabric using whatever method you will launder the eventual garment with – most likely in the washing machine on cool cycle, but if you handwash your lycra or use a special detergent, do that now, too. 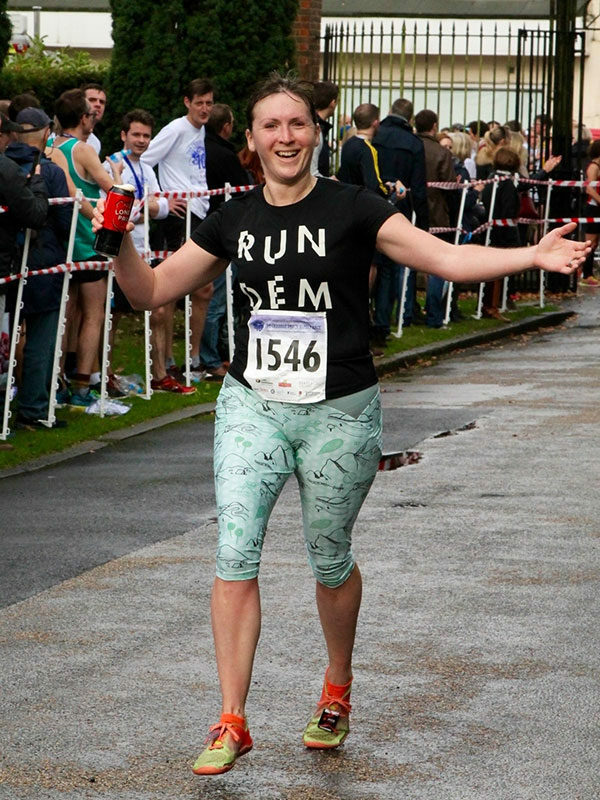 While you’re waiting for the washing to dry, if you’ve not used my Steeplechase Leggings pattern before, I strongly recommend sewing up a version in a cheap lycra, working out it in, and making any tweaks to your pattern before cutting into your lovely limited edition fabric! This is great practice for any new pattern, as we all like our activewear to be just the way we like it, and that’s all personal preference! Time and time again, customers tell me that they achieve the perfect fit on the second (and subsequent!) versions, so it’s well worth making a cheap muslin version first! 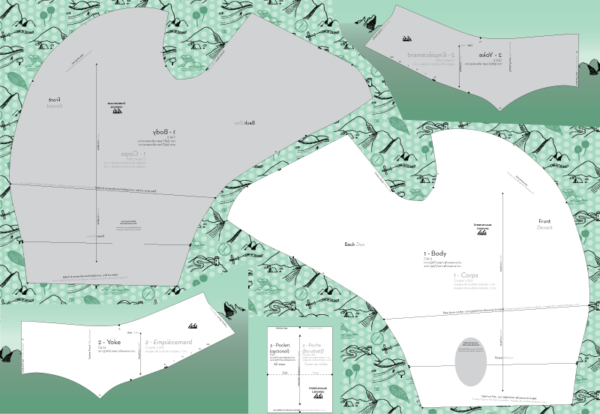 Once you’re happy with your pattern, lay out your pattern pieces onto the fabric like so, making sure that all grainlines are parallel with the edge of the fabric. 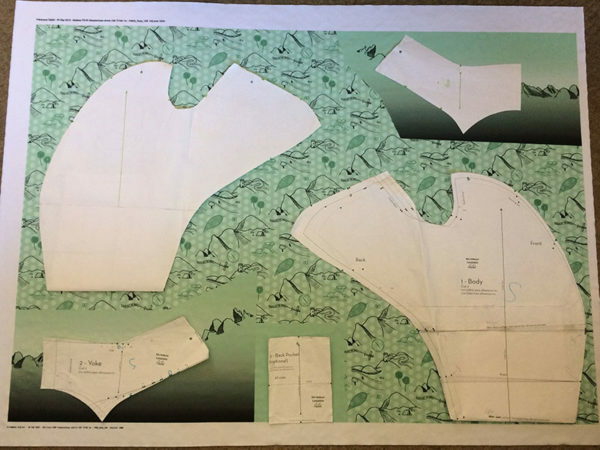 Note that because this is a flat cutting layout, you’ll need to flip the pattern pieces over (the ones shaded in grey above) to get two mirror images, so make sure that you mark the various triangle marks onto the back of your pattern pieces, too. 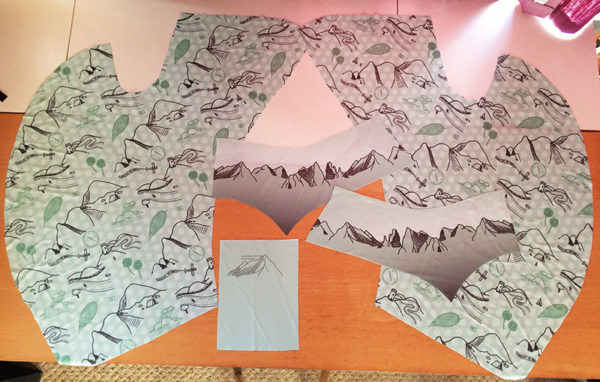 The mountain chain is designed to run around the yoke pieces, so take particular care to line these up as you cut out – you can do this by either cutting out one yoke and using it to align onto the fabric for the second, or by marking the mountains on your paper pattern. Remember that there’s a 4cm (1 1/2in) allowance at the top edge for the elastic, so you’ll want the mountain chain to be closer to the bottom edge of the yoke rather than exactly centred. 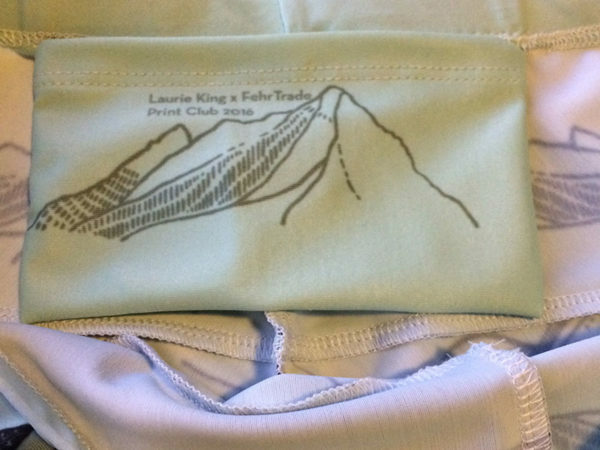 Also, note that there’s a special mountain printed for the inside pocket – this is intentionally upside-down as it gets flipped the right way up as you construct it! So place the pocket pattern piece facing upwards with the mountain upside down in the bottom half. Once you’re all done, the pieces should look something like this (albeit with a greener yoke as my sample metre was too black-heavy and we improved it!). You’re just about ready to dive into the main pattern instructions, but one last point of note is to pre-stretch your waistband elastic. Yup, elastic can lose some recovery, and it’s much better to get that out of the way before it’s sewn into your leggings! So give it a good tug along the full length, just as if you were stretching a balloon before blowing it up, and then cut it to your desired length afterwards. Now you’re ready to jump into the main Steeplechase Leggings pattern instructions at Step One and go on from there! Who’s going to be the first to sew theirs up and share an even better active photo?? Separator image Posted in Article and tagged with fehr-trade-patterns, mflk, steeplechase-leggings. 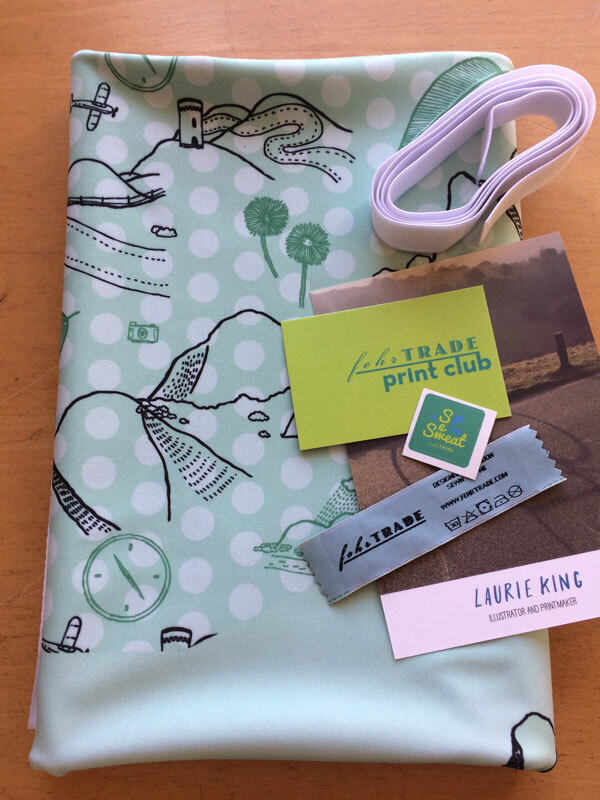 Announcing Print Club – limited edition fabric kits!